Oct 6, MAYAPUR, INDIA (FRI) — After a heavy rain storm in Mayapur on Wednesday, 3 September, devotees were surprised to see what looked like a flimsy inflatable catamaran – barely 12 feet long, open, with no covering against the sun – and five sun-burnt, tired but ecstatic happy devotees float through the main gate, having arrived after a month-long journey on Mother Ganga from Vrindavana. Most devotees could not believe they had actually made it all the way, and indeed, according to HH Mahavishnu Swami, it was an adventure full of tapasya and dangerous challenges. He said that Srila Prabhupada once told a devotee that Krishna Consciousness is an “Adventure in Surrender” – and that this an apt description for this journey. How did he become involved in this journey? 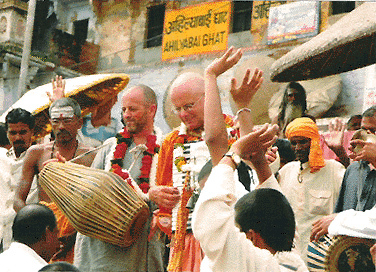 Parasurama dasa of Food For Life UK fame, also known for regularly going on Vraja-Mandal Parikrama where he distributes Prasadam and books on bull-cart, had the desire to complete this spiritual pilgrimage on Mother Ganga. 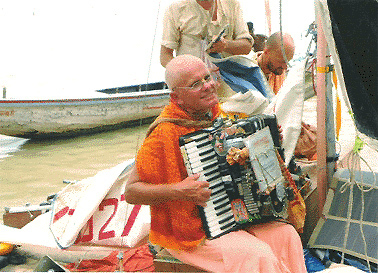 He convinced Mahavishnu Swami to join – after all, the main focus of the journey would be harinama, chanting of the Holy Name – and who else but HH Mahavishnu Swami, veteran harinama devotee and also veteran traveler in Bharata Bhumi as well as in other challenging places like Africa (including Congo and Rwanda!! ), would agree to accept this daunting transcendental adventure? 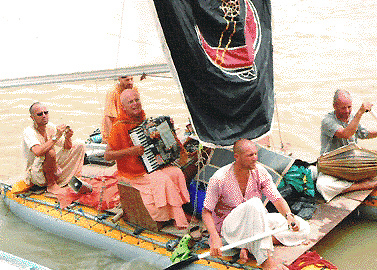 Also on the boat was Rukminiramana dasa from Columbia, Arjuna dasa form Russia and Taruna dasa from Croatia. 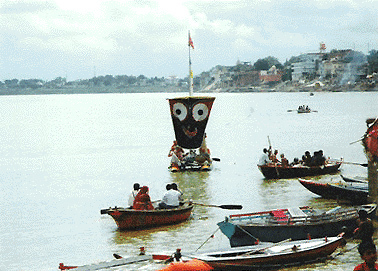 The jal-yatra pilgrimage was 1,800 km long. What was it like? Mahavishnu Swami had a blissful smile on his face when asked this question, but also related how there were some scary times – storms, danger from robbers when sleeping on the banks of the river, and most of all the dangerous electric wires that could hit the mast and sail of the boat. “We had to wait until after dark and then stop at a dry bank to sleep for the night, so that robbers would not see us stopping and know where we were. The most frightening time was when we were sleeping on the river bank, and around 1 am in the morning the river changed course. Parasurama was sleeping on the boat to protect it, but a river bank collapsed on him, and the boat was almost lost that night. We had to fight in the water” says Maharaja. 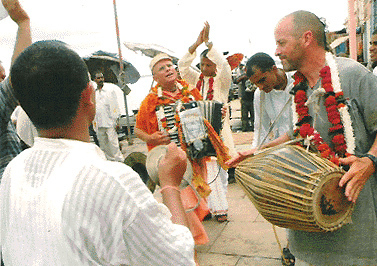 And the final arrival in Mayapur? Mahavishnu Swami was the first to spot the Samadhi through the binoculars, and indeed it was Srila Prabhupada’s Samadhi that saved them as Mayapur was flooded all around and they had to use the compass to try and find the direction to Mayapur and they had gone off course. Upon final arrival they also first visited the Samadhi and circumambulated it before going to the main temple. 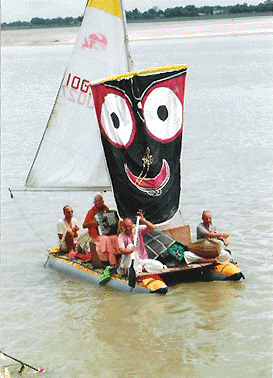 Due to the floods in Mayapur they could go on their catamaran right to the door of Sri Sri Radha-Madhava, where the journey culminated in a raucous kirtana. Incidentally Maharaja’s book bag with the Bhagavad Gita and other scriptures remained intact and dry throughout the journey, but finally got wet in the rain in Mayapur! The Ganga book was soaking wet and the pages sticking together signaled that this was really the end of the journey. Are they planning to do it again? This question was met by silence. We’d have to wait and see…. The team will soon release a VCD documentary of the whole expedition. And for those who are interested in the wild-life aspect of the Ganga – they saw many beautiful fresh-water dolphins but NO crocodiles. mantra all over the web but found it here.